Graftobian are another high-pigment makeup company similar to Kryolan, Cinema Secrets or Kett that are well known for their industrial-strength foundations so i was eager to find out about their vegan/ cruelty free options and sent them my usual inquiry along the lines of, "Could you please confirm if you are a cruelty free company and which, if any of your products are vegan? ", and got this half-assed response in a poorly formatted email. 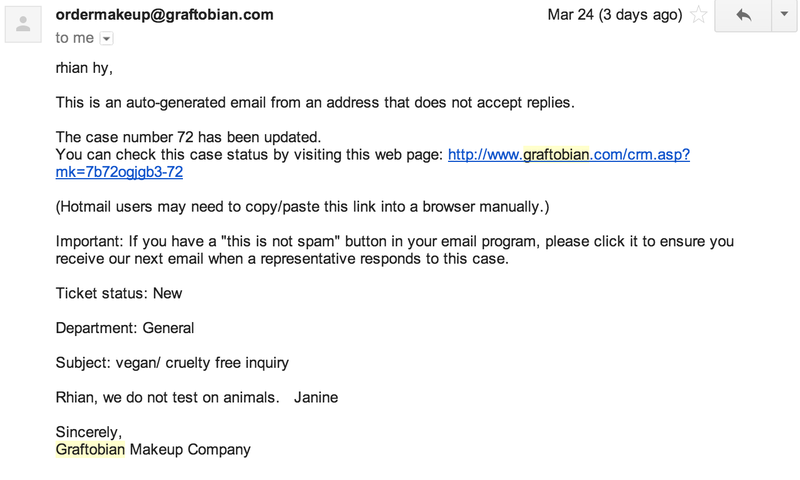 Yep, that's the response at the bottom, "Rhian, we do not test on animals. Janine"
I have encountered even more "helpful" attitude while writing to companies here, in Poland. I love your channel, by the way!